Votes for just having the chief take them in outnumbered each individual path of ask->something else options, but there were more people who wanted to ask than not, so in the spirit of the vote, let's interrogate these guys! That explains why they said they'd fight so well on horseback. 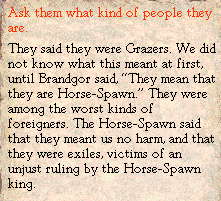 But even though they're horsespawn, everyone was dead-set on accepting them into the clan no matter what they said they were, so let's go! Horray for 2 free (horse-spawn) weaponthanes. MORE COWS. 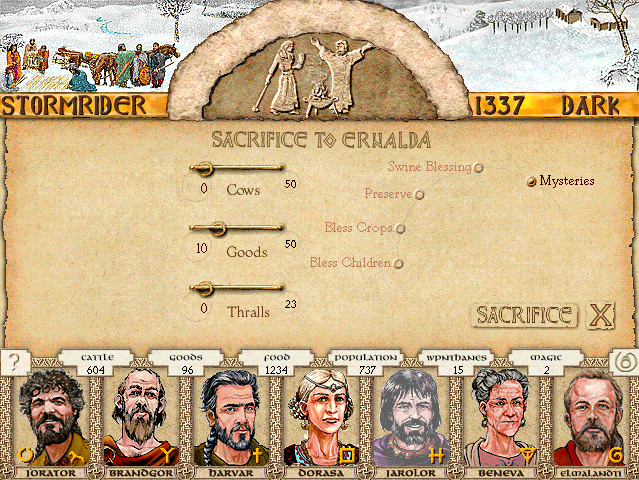 Thank Ernalda we make so much food, or else I really don't know how we'd get more cows except through endless cattle raiding. 21 more people to farm for us, and they're not bringing useless children in tow! We can't do much to get more cows in Dark season, so I sacrifice to Ernalda in hopes of learning a blessing to boost our food output even more. I'd really like to sacrifice to get the mysteries of one of the war gods, but they all prefer cow sacrifices(which we can't afford, in case you missed the recent history of our clan). Preserve reduces food spoilage. 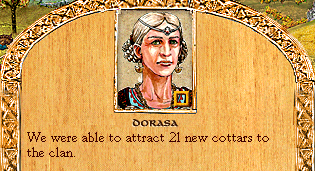 Not the most useful blessing, but it's definitely not Ernalda's worst(that dishonor goes to Bless Children). 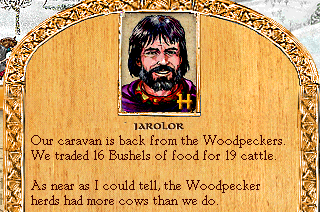 Jarolar, why the hell are you only trading 16 bushels of food at a time when I sent you with a large caravan? Granted, that's a much better food:cows ratio than we usually see, but I'd rather have masses of cows NOW than good profits from tiny trades. A plague has stricken your tula. About 58 have caught the disease so far. They are weak and unable to exert themselves; some of them are barely able to remain concious. 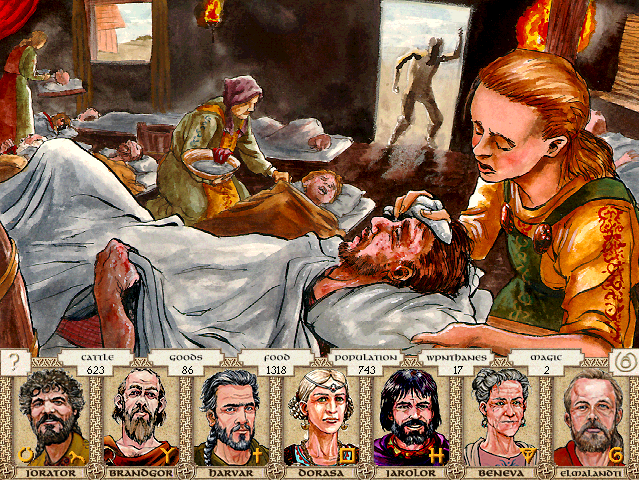 They are feverish; those with more advanced cases also suffer from a painful pox that erupts on their skins. Several children have died. Children are dying? Finally, a good event! -Go to the Hillhaven temple to sacrifice to Chalana Arroy. -Propitiate Malia, goddess of disease. -Send for shamans to chase away the disease spirits. -Tend to the suffering as well as you can. The Hillhavens are our friends. They will help us. A sacrifice to Malia guarantees success, if you sacrifice enough. We can't afford to sacrifice any cows. Sacrifice goods instead. 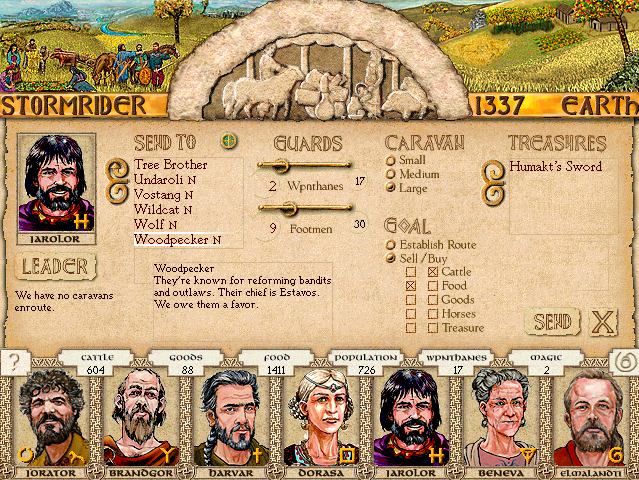 Sacrifice cows, not much-needed trade goods. A sacrifice to Malia guarantees success, if you sacrifice enough. But if you start propitiating her, you must keep doing it forever. Better to sacrifice to Chalana Arroy.